Root Galaxy S5! 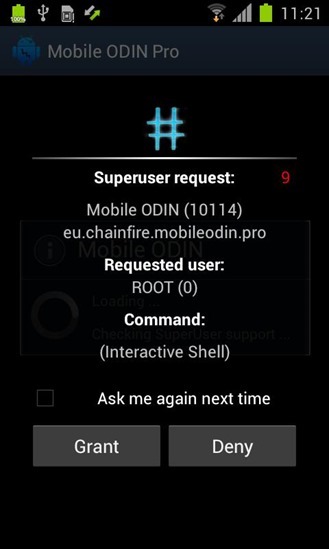 Chainfire Releases Samsung Galaxy S5 Root Solution! Did they actually root Galaxy S5? Samsung announced its latest flagship Android smartphone, the heavily-anticipated Samsung Galaxy S5, last month. While we are still waiting for the flagship to arrive on stores, seems like we have even a bigger news: the device has already been rooted! Thanks to the very well-known and highly trusted developer, Chainfire, the “root Galaxy S5” solution is already out. The root solution is designed keeping the SM-G900F model in mind. Of course, there will be a load more of Galaxy S5 models, but Chainfire thinks the mostly used one would be the international model. It is highly possible that this root solution will work with at least a few regional and carrier variants of Samsung Galaxy S5. If you wish to root Galaxy S5 – of course after being able to buy it – you will have to download the very latest version of CF-Auto-Root tool. This tool is then to be flashed on to your device using ODIN tool on the computer. Chainfire’s Galaxy S5 root solution modifies your device’s recovery, installs the SuperSU app and then re-flashed recovery back to stock to give you a rooted Android device. And then there was CF-Auto-Root for the Galaxy S5! In particular, this is for the SM-G900*F* model. There’ll be a lot of models, but I believe this will be the most common ‘international’ model. I was already in possession of the stock firmware for a bit, but unfortunately my usual contact who test roots on pre-release devices can no longer do so as he also needs to test KNOX facilities, and those will stop working after root. So, I had to wait for someone else to pop-up with an actual device, which happened today. For more details on what’s involved, you’ll want to head over to the XDA developer forum. As for the CF-Auto-Root tool? You can download it by clicking here. Of course, the usefulness of this root method is currently pretty limited as the Galaxy S5 has yet to officially ship – at least outside of South Korea. Still, we have to admit it’s always impressive when root methods surface ahead of the formal arrival of a new Android device.